“Primitive” art can stir up something primal within us today, a feeling of kinship with the artist although we may be separated by centuries. I feel the substance of time, a place I can travel to while standing still. I heft its weight. This moment is a thousand years ago and a thousand years ago is this moment and we are both the same, that woman then and this woman now. 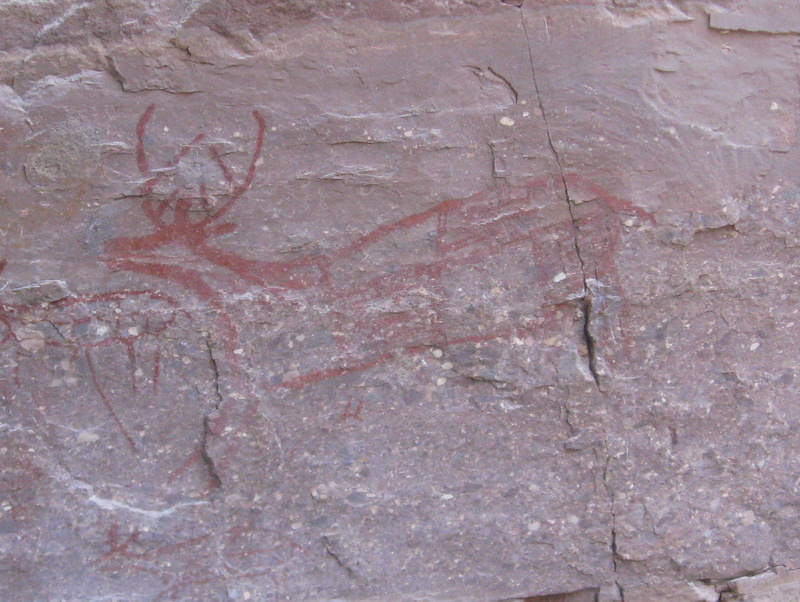 That’s how I feel when viewing pictographs such as the ones pictured above; I react viscerally. The ancient paintings somehow tighten my gut, and I feel an urge to raise my hands to the sky like the figure on the left. These figures are from La Trinidad site in Baja California Sur, Mexico, and the white figures are overshadowed and pre-dated by exquisite forms painted with a deep red mineral paint. 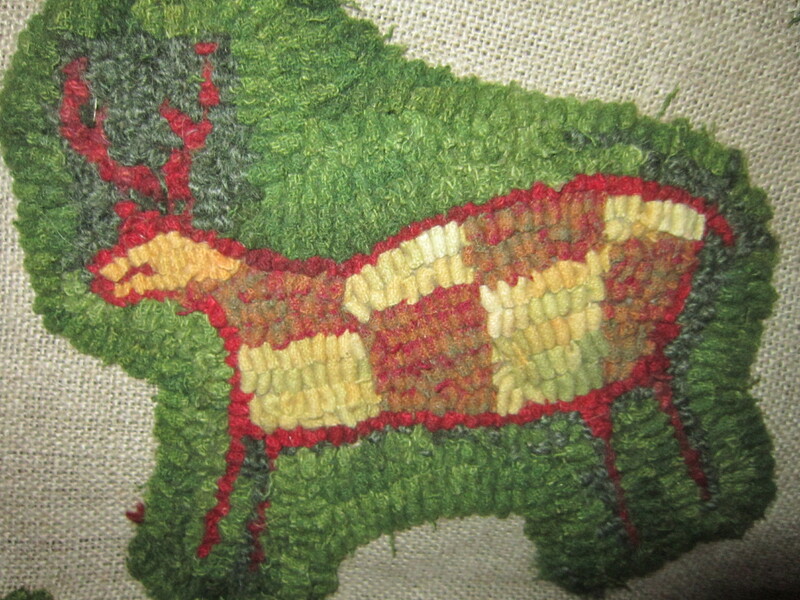 When friend Heather Horsfall urged me to try rug-hooking and to create my own design to represent something meaningful to me, I thought of this deer and drew its form on linen backing to begin a pillow front. As I enjoy the calming activity of using my hands, I think of the ancient artist who had–as do I, as do you–the instinctual, primal urge to create. Time folds in. I am at the center. It may be the closest I ever come to understanding quantum theory. 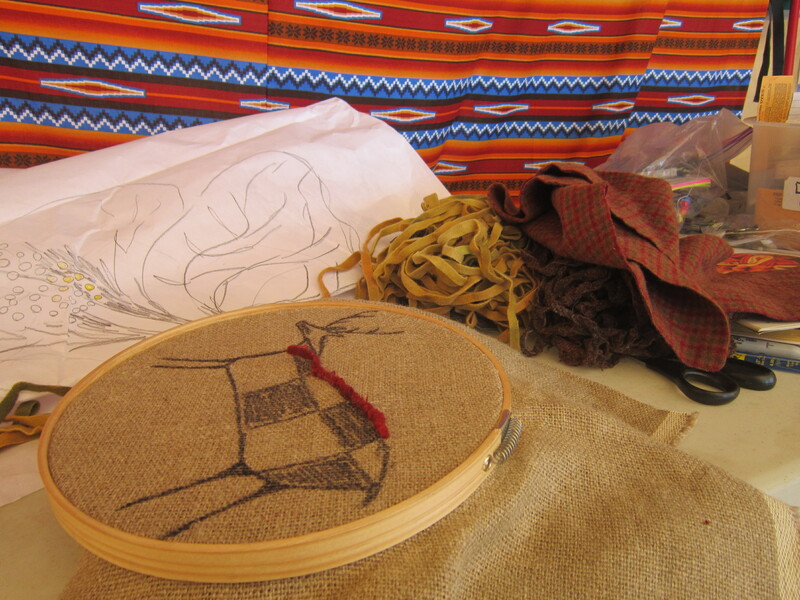 What creative activities calm you or figuratively transport you to a different time? What artistic pieces have caused a personal, emotional response within you? This entry was posted in awareness, Baja, creativity, human stories, landscape. Bookmark the permalink. Isn’t it fascinating how we can feel connected to someone from so long ago? The painters Van Gogh, Monet, and Renoir have caused tears to spring to my eyes when I’ve seen their original work in museums. I like your concept of art as time machine. Thank you for your thoughtful and eloquent response, Linda.